Summer vagrant; recorded breeding sporadically from 1879 to 1964. Migration vagrant. The Lark Bunting was very rare during the Minnesota Breeding Bird Atlas (MNBBA). A Great Plains endemic, the Lark Bunting’s range spans from the southern Canadian provinces south to the panhandles of Oklahoma and Texas; it is found primarily west of the Missouri River and east of the Rocky Mountains. The core of its range is in the northern high plains from central Montana south to northeastern Colorado (Figure 1). This species is nomadic and colonial, changing its breeding site from year to year depending on site conditions across its range. Assigned a Continental Concern Score of 12/20 by Partners in Flight. A short- to medium-distance migrant that winters in Arizona, Texas, and the high plateau of northern Mexico in large wandering flocks searching for the best winter food conditions. During the migration seasons, vagrant birds are found both west to the Pacific Coast and east to the Great Lakes states and provinces, the Maritime Provinces, and the coastal Atlantic states. Most records seem to occur along the immediate coastal shore (Shane 2000). During the summer, the species feeds primarily on insects, especially grasshoppers; in the winter, it feeds on many kinds of seeds, grasses, forbs, and some waste grain. Located on the ground in a shallow depression under or next to a grass clump, tall forbs, or shrubs; the nest is oriented to provide both shade and morning sun (Kingery 1998). Breeding distribution and relative abundance of the Lark Bunting in North America based on the federal Breeding Bird Survey, 2011–2015 (Sauer et al. 2017). The Lark Bunting was first discovered in Minnesota in 1879 when T.S. Roberts and Franklin Benner made their first trip to the western prairies in Grant and Traverse Counties. A single male was collected near Herman in Grant County and a “pair was taken, the female having eggs about to be laid” on the Prairie Coteau above Lake Traverse, Traverse County, where they were common (Roberts and Benner 1880). The next Minnesota records of the Lark Bunting were by Dr. Johan C. Hvoslef in 1893 and 1894, when migrants were seen in Fillmore County (Rustad 1951). Subsequently, the sporadic nature of this species’ occurrence was demonstrated through multiple observations in Minnesota: 1895 (Jackson County); 1897 (“common throughout the southwestern counties as far north as Traverse”); 1900 (in all of the southwestern counties “over an area of at least ten thousand square miles”); 1901 (“only a few birds seen, mostly transients”; counties unknown); 1927 and 1929 (Rock and Pipestone Counties); 1936 (Lac qui Parle and Yellow Medicine Counties [Rysgaard 1936 and Wilson 1937]); and 1964 (Rock and Pipestone Counties). Except as indicated, these records are from Roberts (1932) and Anderson and Getman (1965). The latter two authors investigated the relationship of summer precipitation and habitat suitability in these years and concluded “there seemed to be a correlation between the occurrence of breeding Lark Buntings and below average precipitation.” The last documented nesting of the Lark Bunting in Minnesota was in 1964. One can speculate that habitat change from intensive agriculture in southwestern Minnesota and/or the decline of the core population of this species on the western plains is responsible for the decline in nesting records. The Lark Bunting never was a regular summer resident in the state. Nonetheless, most of the documented breeding records in Minnesota occurred during periodic intervals when the species was expanding: 1895–1897, 1900–1901, 1927–1929, 1936–1937, and 1964 (Anderson and Getman 1965). All the documented breeding records occurred in counties in the southwestern corner of the state, from Traverse County south along the western border to Rock County and east to Jackson County. A summary of breeding records from each county is as follows: Traverse (1879, reported in Roberts 1932); Big Stone (a small “colony of about 25 birds” in 1942, reported in Harrell 1942); Lac qui Parle (nest in 1936 reported in Rysgaard 1936; and nest in 1964 reported in Grant 1965 and Huber 1964); Yellow Medicine (presumed breeding, July to August 1936, reported in Wilson 1937); Lincoln (1897 reported in Roberts 1932); Pipestone (1927, reported in Roberts 1932); Rock (12 pair, nest in 1964, reported in Anderson and Getman 1965); and Jackson (1898, reported in Roberts 1932). Summer observations occurred predominately along the southwest edge of the state from Clay County south to Rock County and east to Jackson and Cottonwood Counties, a slightly larger area than the nesting records. Most summer (June and July) observations were recorded in this region from 1960 to 1995 (35 in the Minnesota Ornithologists’ Union [MOU] seasonal reports). After that time, no summer observations were reported except for a few early June migrants or summer stragglers. Two exceptions were a male observed in appropriate habitat at Glacial Ridge National Wildlife Refuge, Polk County, from June 23 to July 1, 2007 (Kessen and Svingen 2008) and another bird, possibly a straggler, seen in the refuge on June 11, 2016 (MOU Records Committee). There is only one winter record: a bird that remained at a feeder in Winona County from November 12, 1976 to April 22, 1977 (Snyder and Snyder 1977). The geographical distribution of migrating buntings is quite different from the bunting’s distribution in the summer. From 1960-1995 there are 17 records that appear to be only migrants (single spring birds in unlikely habitat) in the species breeding range in southwestern Minnesota; there are none after 1995. In contrast, there are 17 other migrant records from 1961-2010, outside the breeding range, at scattered locations in 13 eastern counties (not including the migration hotspots in the northeastern counties). These are migration vagrants as are the 27 records (both spring and fall) reported along the North Shore in St. Louis (14 records), Lake (5 records), and Cook (8 records) Counties and 5 additional records reported inland in those same counties. This lakeside occurrence is comparable to the many vagrants recorded along the Atlantic Coast, as documented by Shane (2000). Only one Lark Bunting record was documented during the MNBBA (Figure 2). The record was reported from a block in Jackson County on June 14, 2012 (T101R38a). It was coded as “possible” evidence of breeding because it was in appropriate habitat, but the block owner, John Schladweiler, was unable to detect it again, nor could other bird-watchers. A picture and description of the observation are published (Schladweiler 2012). Except for the Dakotas, there is no breeding evidence for the Lark Bunting in adjacent states. It is accidental in Wisconsin (Robbins 1991) and casual to accidental in Iowa (Kent and Dinsmore 1996). Breeding distribution of the Lark Bunting in Minnesota based on the Breeding Bird Atlas (2009 – 2013). Summary statistics for the Lark Bunting observations by breeding status category for all blocks and priority blocks (each 5 km x 5 km) surveyed during the Minnesota Breeding Bird Atlas (2009-2013). The Lark Bunting is found in prairie grassland, shrub-steppe, desert grassland, and agricultural areas of the high plains. It is nomadic and varies its breeding grounds depending on the weather and its impact on available foods. Variation in precipitation and subsequent food availability influences breeding success, particularly in seasonally unpredictable climates such as the Great Plains, where drought often affects food supplies over broad areas of the landscape (Shane 2000). In Colorado (where it is the state bird), atlas participants found the Lark Bunting more common in shortgrass prairie than in mid and tall grasses but also in cropland and farm fields. “Buntings use shortgrass, if not heavily grazed and if interspersed with taller vegetation (sunflowers, ragweed, thistles)” (Kingery 1998). Its nomadic breeding strategy means that its numbers can fluctuate widely from year to year and from place to place. The North American population estimate for the Lark Bunting is 10 million birds (Rosenberg et al. 2016). 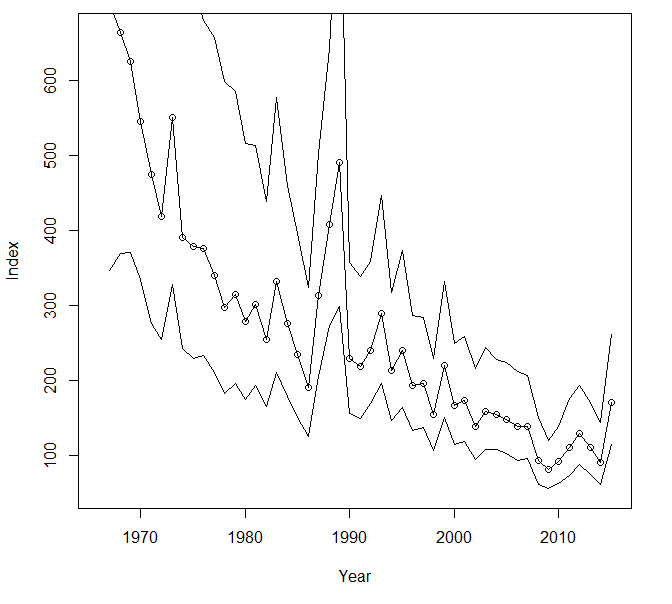 Long-term monitoring data collected by the federal Breeding Bird Survey (BBS) document a significant, range-wide decline from 1966 to 2015 that averages 2.90% per year (Figure 3). A few of the significant declines are in regions immediately west of Minnesota: the Prairie Pothole Region (an average of −4.60 % per year), North Dakota (an average of −8.03 % per year), and South Dakota (an average of −3.55 % per year) (Sauer et al. 2017). Partners in Flight estimated that the population has experienced a cumulative decline of 86% from 1970 to 2014 (Rosenberg et al. 2016). BBS data are the only data available to monitor long-term population trends. Nevertheless, their suitability for this nomadic species is a concern. BBS survey routes are “probably not adequate for this species” (Kingery 1998; Shane 2000). Few data are available to explain the factors responsible for the decline. Much of the native grassland habitat within the species’ breeding range is now tilled cropland but, as Shane (2000) notes, the birds do successfully nest in agricultural fields. Loss and degradation of native grasslands in the winter range may be one potential factor influencing breeding populations (Shane 2000). Breeding population trend for the Lark Bunting in North America for 1966–2015 based on the federal Breeding Bird Survey (Sauer et al. 2017). Partners in Flight has assigned the Lark Bunting a moderate Continental Concern Score of 12/20 (Rosenberg et al. 2016). The species’ steep population decline, coupled with threats to its breeding and wintering habitat, were important considerations. In the future, warming temperatures may also pose a threat to this species. A preliminary assessment ranked its vulnerability to climate change as medium (North American Bird Conservation Initiative 2010). More field assessments of suitable habitat quality are needed to guide conservation efforts, especially in areas where degradation or loss of native prairie, sagebrush, desert grasslands, and reclaimed grasslands has been severe. The Conservation Reserve Program (CRP) of the U.S. Department of Agriculture has resulted in some positive population increases in the Dakotas (Shane 2000) of this strikingly distinct sparrow species. Anderson, Bertin W., and S. Peter Getman. 1965. “Lark Bunting Occurrence in Southwestern Minnesota.” Loon 37: 63–69. Grant, R. A. 1965. “Breeding Lark Buntings and American Avocets in Lac qui Parle County.” Loon 37: 82–83. Harrell, Byron E. 1942. “Minnesota Nesting Records, 1942.” Flicker 14: 33–40. Huber, Ronald L. 1964. “The Summer Season.” Loon 36: 83–91. Kingery, Hugh E. 1998. “Lark Bunting.” In Colorado Breeding Bird Atlas, edited by Hugh E. Kingery, 468–469. Denver: Colorado Bird Atlas Partnership and Colorado Division of Wildlife. Roberts, Thomas S., and Franklin Benner. 1880. “A Contribution to the Ornithology of Minnesota.” Bulletin of the Nuttall Ornithological Club 5: 11–20. Rustad, Orwin. A. 1951. “The Lark Bunting in Rice County.” Flicker 23: 18–19. Rysgaard, George N. 1936. “The 1936 Nesting Season.” Flicker 8: 26–45. Schladweiler, John. 2012. “Lark Bunting in Jackson County.” Loon 84: 153–154. Snyder, Will, and Betty Snyder. 1977. “An Unusual Visitor at Our Feeder.” Loon 49: 105–106. Wilson, N. O. 1937. “Lark Bunting Invasion.” Journal of Minnesota Ornithology 1: 9–10.